What key is the song “Malaguena” (Spanish dance) in that it uses the following chord progression; Am, G, F and E? It appears to be in the key of C except the E major chord. Shouldn’t it be E minor? And what scale can I play over it? You’re right, the E chord should be minor. Then everything fits into the C major scale. 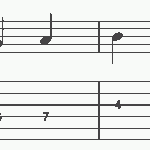 In this example, the Am chord is functioning as the root (tonic). “A” is the relative minor (sixth degree) to “C”. So this would be called A Aeolian mode or A natural minor. But the E major chord has a raised third, G#. Often times a progression like this includes an E7 which has a V7 pull and resolution to the tonic Am. And when the E major, or E7, chord comes up, the lead/melody usually raises the G to G# too. Then back to G natural when the progression returns to Am. This is called the harmonic minor scale. Specifically, this application would be called the “A harmonic minor scale” because the Am is functioning as the root (tonic). Anytime you raise the seventh scale degree of a natural minor scale you create a V7 chord and harmonic minor scale. You can hear this done in songs like “Smooth” by Santana, “I Will Survive” by Gloria Gaynor, and “Nothing Else Matters” by Metallica (E harmonic minor) just to name a few. 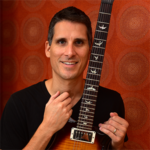 You get to know harmonic minor chord progressions, harmonic minor scale songs, and how to use harmonic minor scale patterns in my book, Fretboard Theory Volume II.